There are a few amazing metaphors that Rebellion break out in this Sniper Elite 3 dev diary. The best has to be the onion analogy, in which their Head of Art starts talking about the layers of the vegetable, only to shift into describing the layers of skin, flesh and gristle that are being shredded to bits as part of the game's much "improved" X-Ray Killcam. I've never really understood the purpose of Sniper Elite's Killcam - at least in its more detailed V2 X-Ray variant. Successful sniping gives me a clinical, almost mathematical thrill of battling physics and ballistics. That's rarely enhanced by another slow, gruesomely detailed goresplosion of bone shards and arterial fluid. It's always surprising to see them make such big a deal of the feature in pre-release media. The argument made in the video is that Rebellion aren't flinching away from the damage caused by a sniper's bullet. I'm not convinced, though. 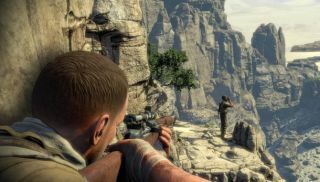 Sniper Elite V2 felt as if it was leering towards that damage; slowly - covetously - lingering on the meatgasm of human debris while an imagined Greek chorus of lads went "phwoar, ey?" in the distance. To be clear, it's not that I think it's offensive or dangerous, just boring and not in tune with Sniper Elite's strengths. This sequel could, of course, completely change how it's positioned within the game. On the basis of this video, though, it seems like they're content with just turning up the excess. Sniper Elite 3 is due out in the second quarter of the year.